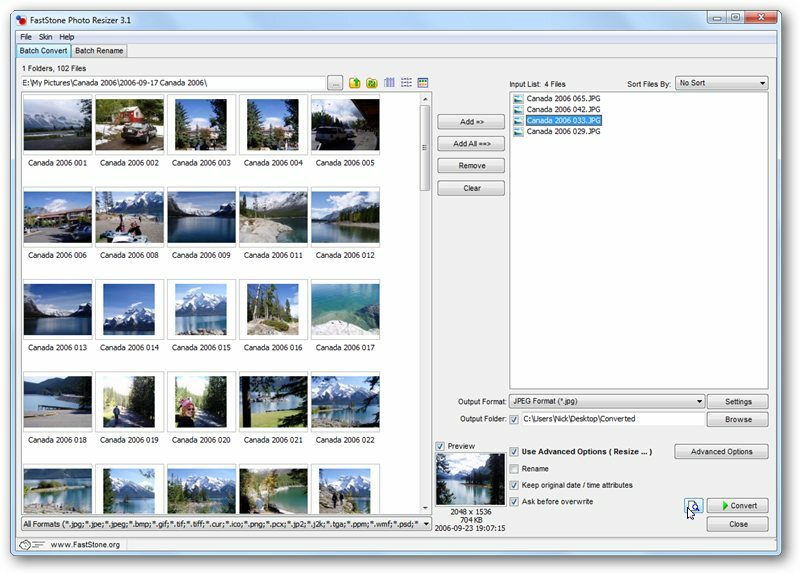 Simple, powerful, fast, free for personal use: Faststone Photo Resizer ticks all the right boxes. Ever been confronted by a large number of photos you need to convert, rename, resize or otherwise edit? Does the thought of doing all that by hand bring on a headache? Faststone Photo Resizer is just the tool you need. Its name does it a major disservice: Faststone Photo Resizer can resize photos, of course, but that’s just a small part of what it does. Ultimately, though, naming it for its entire feature set would make it somewhat unwieldy: “Faststone Take A Group of Images Of Varying Formats And From Different Locations, Convert Them To A Single Format, Rename Them, Perform Advanced Batch Processing Such As Resizing, Cropping, Watermarking, Colouring, Etc” doesn’t have quite the same ring, does it? It’s remarkably simple to use: the program opens with a two-paned window: use the left-hand one to browse for your chosen images – Faststone supports the vast majority of image formats, including Photoshop EPS and PSD formats, then select them and click Add or Add All to add them to the “Input list” of images for processing. You can grab images from multiple locations if you so wish. The basic conversion and renaming tools are on the right: Faststone can convert to most popular image formats including JPEG, PNG, TIF and BMP (it’ll even convert to PDF), and the renaming section allows you to use wildcards for sequential numbering. Pick an output folder if you wish to collate your converted images in one folder, and you’re good to go. Almost. Tick Use Advanced Options… and click the button that appears to open a new dialog box with all the editing options you could want: resize, rotate, crop, change canvas size, colour depth, perform adjustments like brightness and contrast, add text or image-based watermarks, add a border or change the DPI. It’s all here: tick the option or options you want and fine-tune the settings to your needs. Use the magnifying glass icon to preview your changes on the currently selected image in the Input list before clicking OK.
Users of FastStone Image Viewer have no need for FastStone Photo Resizer, because all of its functionality is already built into that program (just select Tools > Open Batch Convert / Rename Dialog). Utterly essential batch image processing tool for anyone who’s confronted with a large group of images they have to convert, rename or tweak.